Urban planning is in no way gender neutral. From bus schedules that fail to respond to the complexity of women’s travel patterns that include their household and care responsibilities to street lighting for cars but not pedestrians to lack of public statues depicting women, women receive the message that cities are not made for them. This is further aggravated by men’s dismissal of women’s fear of sexual harassment on city streets and by bystanders who routinely witness men giving women unwanted verbal or physical attention but do nothing as they see it unfold. In the last ten years, many efforts have been undertaken by cities to address this bias. When the city of Edmonton took steps to integrate safety into their urban planning, it applied crime prevention through environmental design (CPTED) principles to increase safety.When more than two decades ago Vienna embarked on a plan to incorporate a gender lens into urban design with the creation of the pioneer Women-Work-City, the city specifically considered women’s needs and experiences. The hope is that such spatial transformation will result in social transformation: Cities that are as safe for women as they are for men will be cities in which women enjoy equal rights and opportunities (in all ways) as men. Montreal is recognized as a pioneering city in terms of women’s safety in public spaces. The City of Montreal created a dedicated program, Programme Femmes et ville – Ville de Montréal (women and the city program) in response to calls for municipal leadership to address gender equality across all of the city’s work. Increasing women’s safety was identified as the key objective for the program, and the built environment was seen as a priority area to work in to achieve this. Under this banner, the city developed policies and guidelines to increase women’s safety in urban planning, and upgrades were introduced to the built environment. Information about the program and its work was widely disseminated throughout the province, country, and internationally, thus cementing Montreal’s reputation as a city that prioritizes women’s safety. Montreal institutionalized safety planning and started conducting women’s safety audits. The City of Montreal, through its women and the city program produced a handbook to integrate safety into urban planning and developed six principles of design for women’s safety that include such elements as visibility, signage, and maintenance. (These principles also underlie the safety audits.) This paradigm shift in urban design informed some important improvements in the city. Most notably, clear panels replaced brick and painted walls in metro stations and underground car parks, allowing people to both see and be seen and to plan escape routes should they fear for their safety. This, coupled with other interventions including the Between two stops program that allows women to request a bus driver to let her off closer to her destination when it is dark out, signal to women that their safety is important. Efforts to make the city safer and gender inclusive must be done with a diversity of women. Since 2008,the Montréal-based organization Women in Cities Internationalhas been working to deliberately engage in the planning process groups of women who experience greater exclusion due to other identity markers (such as age, class, and ability). For example, WICI led the pan-Canadian project Together for Women’s Safety to adapt safety audits to four different groups of women: the elderly, new immigrant, differently-abled and aboriginal. This project informed the redevelopment of a city park representing an investment of $1.2 million CAD and resulted in media coverage of missing and murdered Aboriginal women, and the moving of a paratransit bus stop from a loading dock behind a university to a street with an existing bus stop. And it spurred WICI to add to its work a seventh principle of design for women’s safety: accessibility and inclusion. 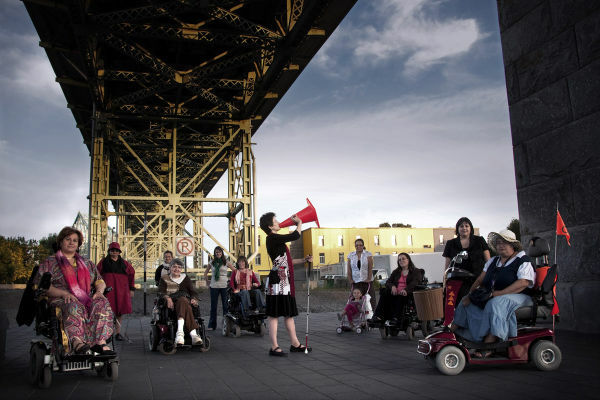 Differently-abled women face additional barriers of accessibility and inclusion in asserting their rights to the city. 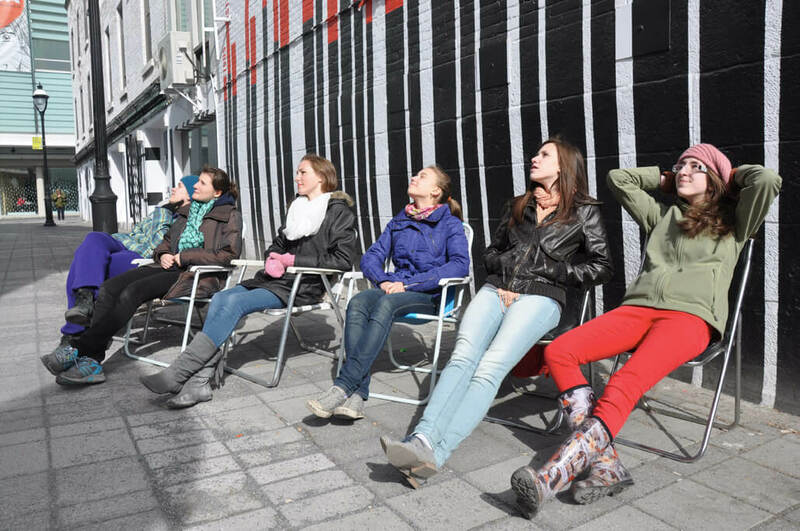 There are many examples of smaller-scale interventions to reclaim public space for women and girls in artistic ways. In WICI’s My City, My Safety! 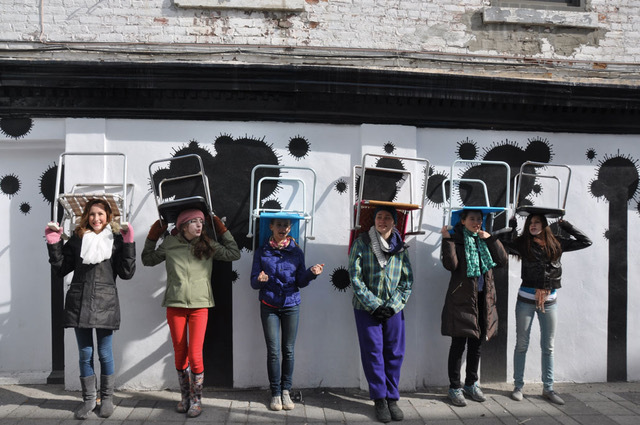 project, adolescent girls painted murals and developed a “nomad box” (a box containing gear for going on a specific adventure) decorated with messages and photographs that invited participants to experience the city through girls’ eyes. Finally, inspired by the Why Loiter movement in Mumbai, India, the teens also occupied municipal parking lots and other public spaces to symbolically reclaim those spaces for girls. 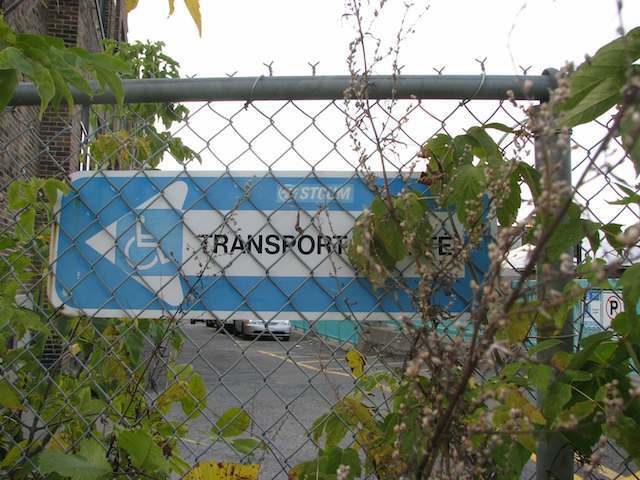 A transit sign pointing users to the site of the paratransit stop is covered in branches and pointing to an empty loading dock, causing women who use the service to feel unsafe in accessing it after dark. For millennia and throughout the world, sexism has been sewn into the fabric of urban life for women. This is because cities have always been designed by men, for men, and to celebrate men. It is only when we acknowledge this history and the deleterious effect it has had on women’s safety, freedom, and sense of equality that urban women will enjoy the same privileges as urban men. Thanks to progressive communities such as Montreal and to pioneering organizations such as Women in Cities International, this expansion in human rights is under way. The Programme Femmes et ville – Ville de Montréal was active between 1989 and 2005.